The Thomas R. Beecher, Jr. Innovation Center, located in the heart of the Buffalo Niagara Medical Campus (BNMC) in downtown Buffalo, NY, is a state-of-the-art, LEED-certified building with a collaborative environment designed to foster innovation and creativity among companies seeking to be a part of the thriving area. This site is an example of adaptive reuse and the ongoing renaissance of Western NY, as the century old industrial powerhouse is being transformed and revitalized. Created in 2001, the BNMC is comprised of 6.5 million square feet of clinical, research and support space on over 120 acres dedicated to the cultivation of a world-class medical campus for patient care, research, education, and entrepreneurship. Immediate investment and growth has been planned with more than two million square feet currently or soon-to-be under construction, equaling an investment of $750 million in private and public funding. This redevelopment site is comprised of approximately 2 acers (0.8 ha) of impervious surface, including sidewalks and asphalt pavement. Initially, a bioretention facility was proposed as the water quality and volume treatment practice. This project came about as a result of the City of Buffalo being under a Federal mandate to reduce the volume of CSO entering the Buffalo River. 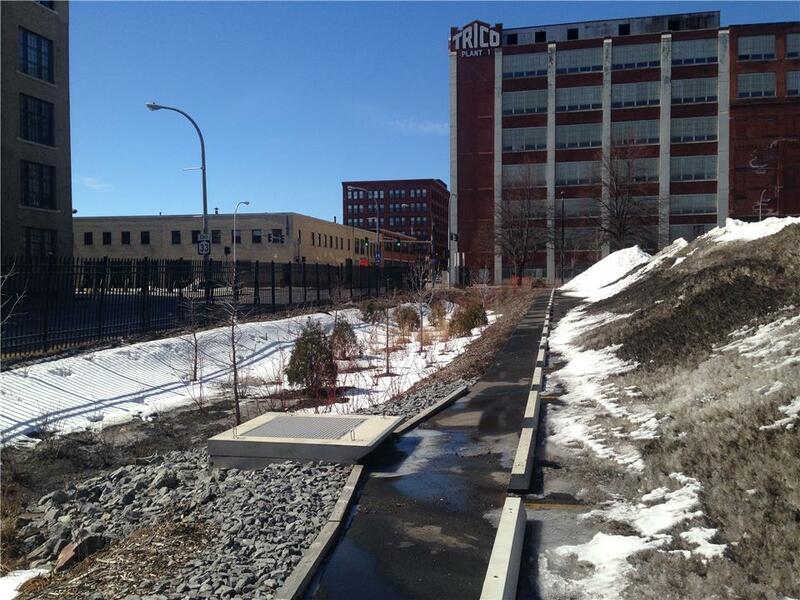 “We explored traditional grey infrastructure options for storm water on this site. At the time it had no catch basins and sheet drained to the southern end of the lot. Rather than redirect the water through traditional grey infrastructure we looked to deploy green in combination with grey infrastructure for both aesthetic and environmental considerations. The volume of rainwater held on site and pollutants removed from the surface overflow via the Jellyfish Filter not only provide benefit to the Medical Campus, but directly improves the visitor experience at Canalside, one of Buffalo’s emerging centers of recreation and commerce. This is due to the fact that previously the combined sewer overflow this lot would eventually feed, would enter the Buffalo River at Canalside,” explained Mark McGovern, Senior Project Manager at the Innovation Center. After reviewing the NYSDEC Stormwater Management Design Manual requirements for biorention as a stormwater management practice (SMP), Sustainable Resource Group in cooperation with the Innovation Center elected to use a green and grey approach by incorporating a Jellyfish Filter curb inlet unit as pretreatment to the bioretention cell. The site design included a large asphalt parking lot graded to direct runoff and snow melt toward the Jellyfish Filter unit, which is located just prior to the bioretention cell. The compact 4 ft. by 4 ft. unit houses three membrane cartridges with a total filtration surface area of 847 ft2 (79 m2). It is designed to accept runoff through a curb inlet with a driving head of 12 in. (305 mm), provide treatment, and then discharge treated water through an open back over riprap into the bioretention cell. 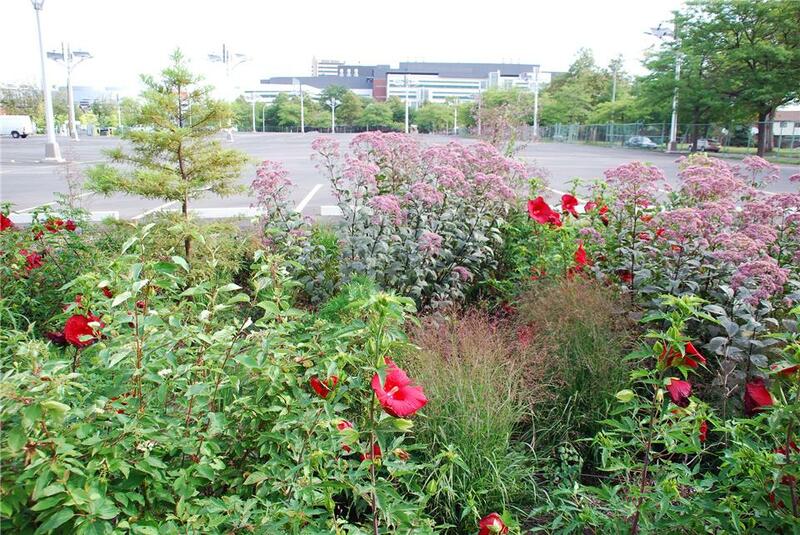 The bioretention cell extends the full witdth of the parking lot, approximately 200 ft. (60 m), with a filtration surface area of 1900 ft2 (177 m2). Combining grey treatment technology with green treatment practices as part of a treatment train approach offers several benefits. Using the Jellyfish Filter to pretreat bioretention on a site with limited available drop makes the flexibly designed Jellyfish Filter a good fit. The unit’s placement, along the curb line with a hatch, provides a single point of access for easy inspection and maintenance. When considering the urban setting and snowmelt pollutant loading, the treatment approach provides trash and debris removal making the overall site more aesthetically pleasing while extending the service life of the bioretention cell. This keeps the long-term cost of inspection and maintenance to a minimum. Without the curb-side pretreatment, unsightly debris, hydrocarbons, and sediment could easily clog the bioretention’s surface filtration area and create an eye-sore. The Jellyfish Filter is a fitting component at the state-of-the-art Innovation Center site.